via the marshes and the sublime.. This small piece of felt made with snips from a silk hanky reminds me of those crystallised violets used for cake decoration and those soapy tubes of sweets! A fun morning making felt. 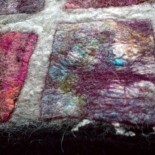 For the full instructions, for this project see the Textiles section of this site for the page on decorative felt.